“Civil disobedience is often necessary to make important changes possible, like the abolition of slavery, the women’s rights to vote, and the civil rights movement,” said John LaForge, co-director of Nukewatch, the Luck, Wisconsin peace group, which helped organize a 9-person US delegation to the protest. 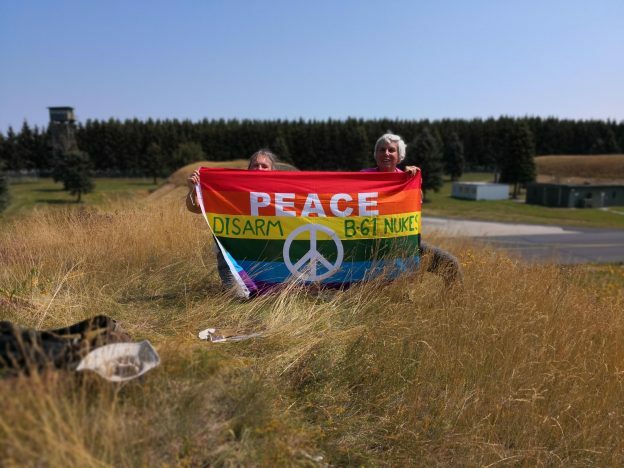 The nonviolent campaign is part of the ICAN network, which received the Nobel Peace Prize in 2017, and recently called for nonviolent direct actions on nuclear bases to urge more countries to sign the treaty ban. The Dutch activist and Catholic Worker Frits ter Kuile said: “My motivation is the commandment to love one’s “enemies”, and the Nuremberg principles stating that everyone is responsible for the crimes their government commits. We have the duty to take down the fences that protect nuclear mass destruction, and reclaim the land for the people and their real needs”. 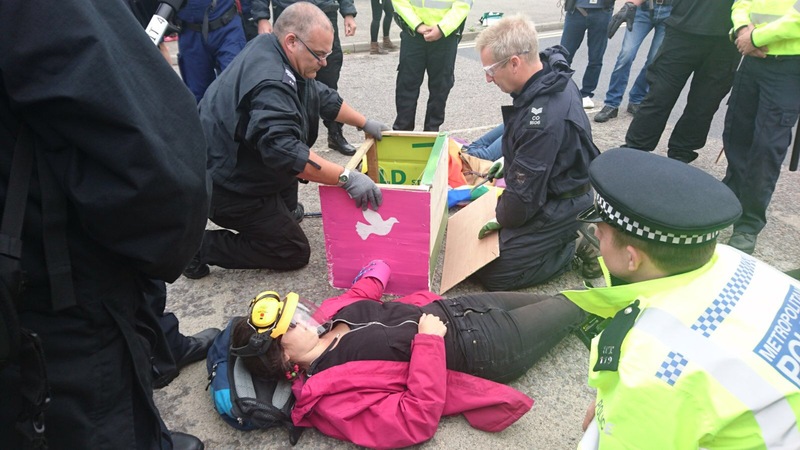 This entry was posted in nuclear weapons and tagged anti-Trident, catholic worker, ICAN, ploughshares on July 16, 2018 by faithandresistance. More information and photos are on the CCA website: https://christianclimateaction.wordpress.com. More about possible fracking at Tinker Lane and those who are fighting it here. 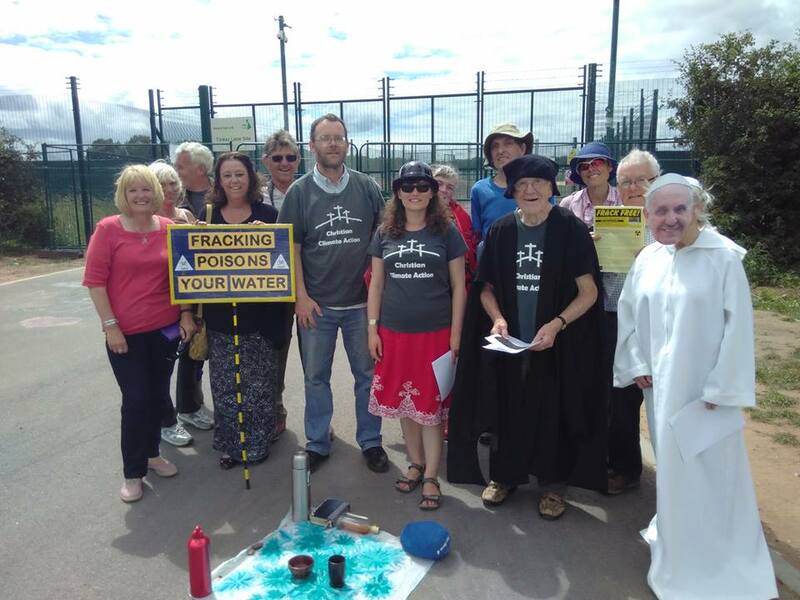 This entry was posted in climate change and tagged Christian Climate Action, fracking, Martin Luther King, Martin Newell on June 27, 2018 by faithandresistance. 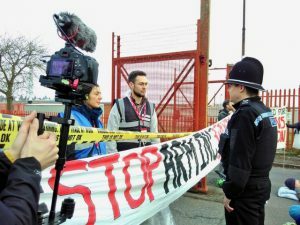 Earlier this week ‘The People’s Weapons Inspectors’ blocked the main gate of arms manufacturer Roxel in the West Midlands and requested to inspect the site. 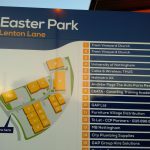 The group, which included members of Put Down the Sword and the London Catholic Worker, believe the site is supplying weapons components that will be used by the Saudi Arabian military to commit war crimes against the people of Yemen. 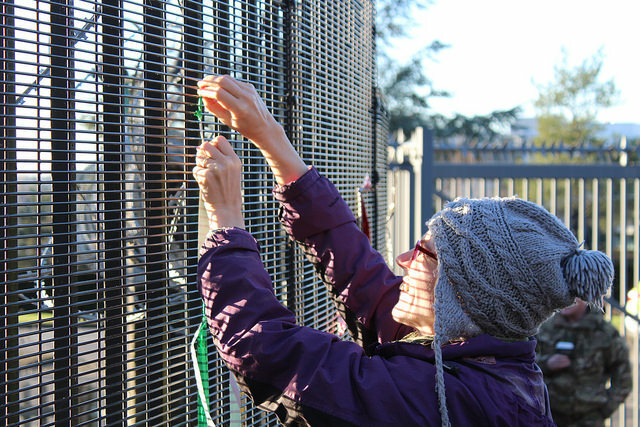 At around 07:35AM on Monday 9th April the activists parked outside Roxel and blocked the gates using a lock-on tube. 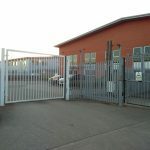 Others requested that they be allowed access to inspect the site and question the directors. They unfurled banners reading “Site closed for weapons inspection” and “Roxel: stop arming Saudi”. 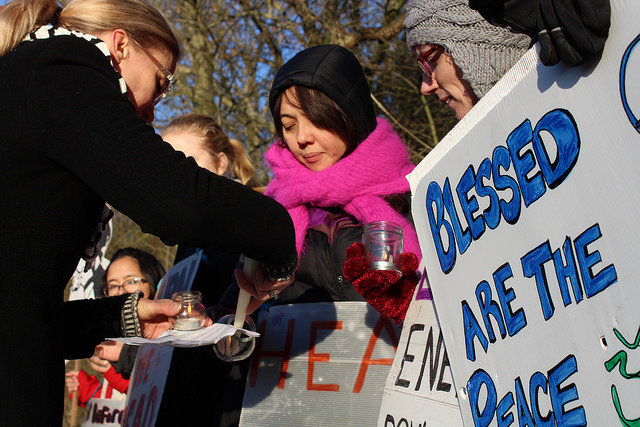 Some took part in a prayer service remembering the thousands of victims of the war in Yemen. The group allege that Roxel are manufacturing propulsion systems for Brimstone air-to-surface missiles which are to be delivered to Saudi Arabia. The protesters aimed to deliver evidence of Roxel’s alleged weapons deal and of Saudi war crimes against the people of Yemen. 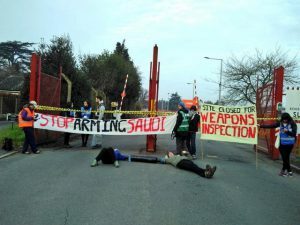 They are calling upon the British government to stop supplying export licenses for British arms sales to Saudi Arabia. Civil war has been raging in Yemen – one of the world’s poorest countries – for over three years. As of October 2017, hospitals in Yemen reported almost 9000 casualties and over 50,000 injuries. The UN says that more than 60% of civilian deaths have been the result of air strikes led by the Royal Saudi Air Force. The impacts of the conflict have been catastrophic. Yemen is experiencing the world’s largest cholera outbreak. About 22 million people – 75% of the population – are in need of humanitarian assistance. The UN calls the situation the world’s worst man-made humanitarian disaster. The People’s Weapons Inspectors, including members of Put Down The Sword and London Catholic Worker, decided that they had to act when on the 12th March 2018 an order in progress for one thousand Brimstone missiles for Tornado jets appeared on the SIPRI* Arms Transfer Database. Now, dozens of police are attending the scene and many workers are unable to fully access the site and continue their work building missiles. According to Human Rights Watch, since Saudi Arabia pledged to reduce civilian harm in coalition attacks in 2017, there have been at least six unlawful coalition attacks, 55 civilians, including 33 children, killed. Evidence is also emerging on the SIPRI Arms Transfer Database of first time orders of an unconfirmed quantity, for both Brimstone and Stormshadow missiles to Saudi Coalition partner Kuwait. This entry was posted in arms trade and tagged arms companies, missiles, put down the sword, stop arming Saudi on April 11, 2018 by faithandresistance. 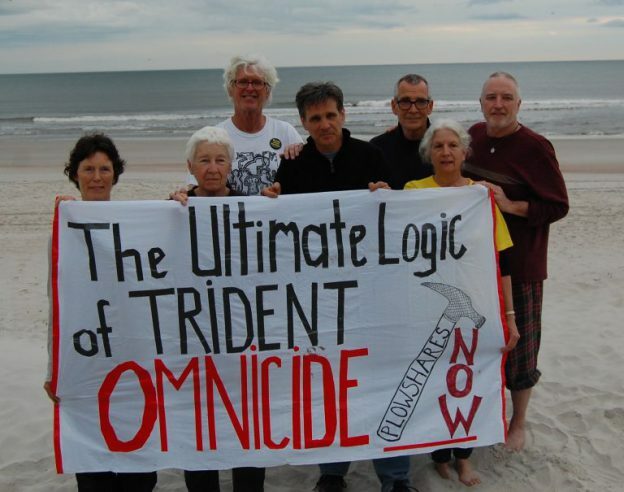 ‘On the evening April 4, the fiftieth anniversary of the assassination of Martin Luther King Jr., seven Catholic peace activists entered Kings Bay naval base for a nuclear disarmament action aimed at the Trident submarines which are based there. Most come from Catholic Worker backgrounds. The seven entered the base as darkness fell and walked to three different sites, the nuclear weapons storage bunkers, the nuclear weapons administration building and a monument site with replica missiles. They hung banners and poured blood, spray painted, put up crime scene tape and hammered on the missile display. They managed to send out some photos and videos before being apprehended in the early morning. This entry was posted in anti war, nuclear weapons and tagged anti-Trident, catholic worker, Martin Luther King, US on April 11, 2018 by faithandresistance. 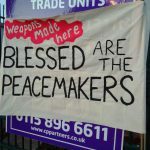 This entry was posted in arms trade, events and tagged MiChA, midlands, Nottingham, vigil on March 14, 2018 by faithandresistance. 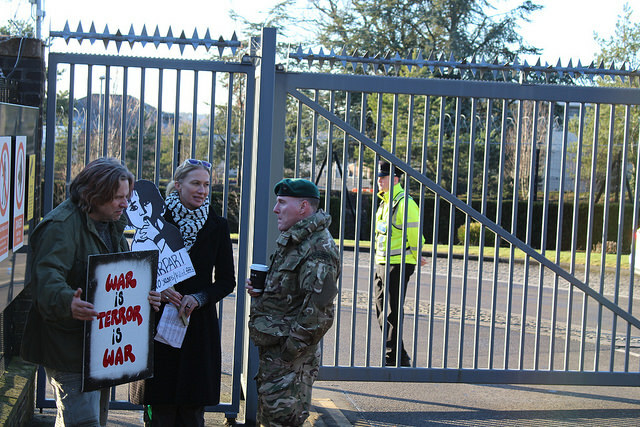 This entry was posted in arms trade and tagged catholic worker, Martin Newell, Passionists, stopDSEI on March 6, 2018 by faithandresistance. 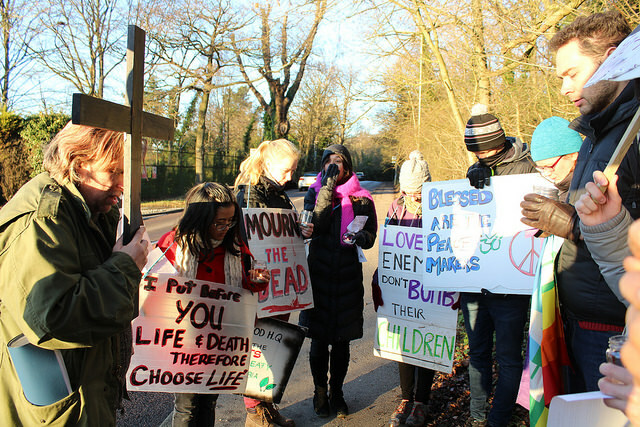 This entry was posted in nuclear weapons and tagged ash wednesday MOD, catholic worker, pax christi, peace, resistance on February 15, 2018 by faithandresistance. 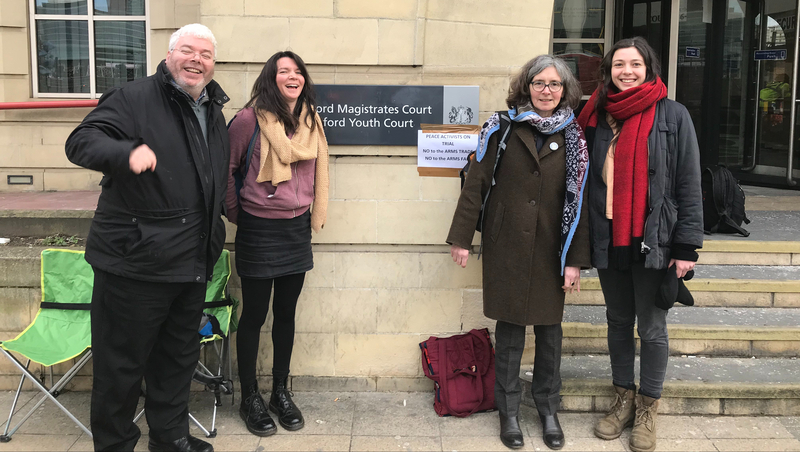 This entry was posted in arms trade and tagged armstrade, catholic worker, DSEi, nonviolent, peace, resistance, trial date on February 9, 2018 by faithandresistance. 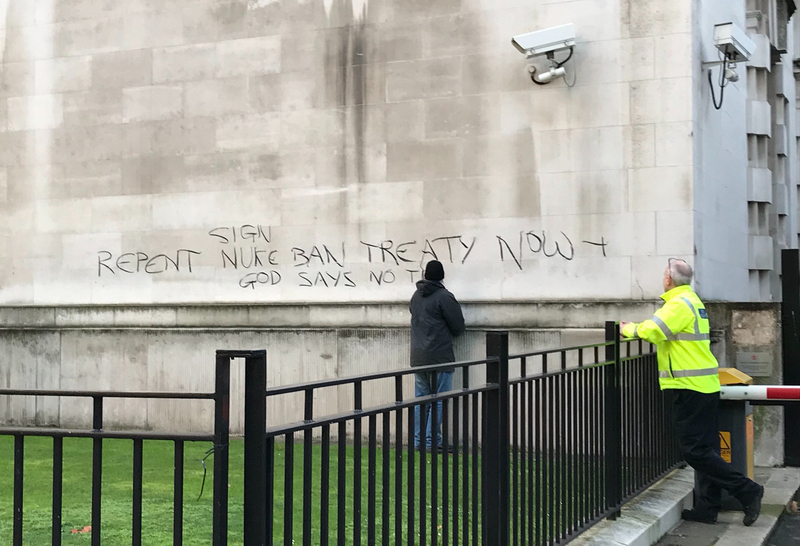 This entry was posted in arms trade and tagged arms companies, catholic worker, DSEi, peace, resistance, trial date on January 29, 2018 by faithandresistance. This entry was posted in anti war and tagged catholic worker, peace, resistance on January 5, 2018 by faithandresistance.